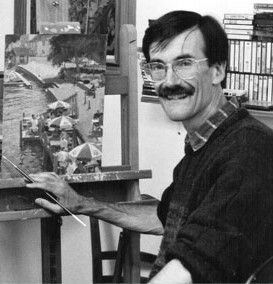 David Curtis was elected to the Royal Society of Marine Artists in 1983 and a member of the Royal Institute of Oil Painters in 1988. Essentially, a plein air and figurative painter, working in both oils and watercolours, David observes transient lighting conditions and effects of atmosphere in his compositions. He is the author six books including A Light Touch, the Landscape in Oils, Light and Mood in Watercolour and Painting on Location. David is a regular exhibitor in all the major National Society exhibitions and has work held in private collections, both nationally and abroad. Katy Went is the Creative Media Manager for Paint Out. Whilst her background is in Economics, Languages, Technology and Photography, she has become a public speaker, activist and writer on diverse subjects from the arts to human rights, equality to politics, and mental health to entertainment. She reluctantly gave up art at school after O levels, despite a love for it, but was fond of pencil, pen and ink, and calligraphy on vellum. Her parents were both amateur artists, yet, like their parents before them, encouraged her to get a “proper job” – like that ever works! She released her creative streak through writing and an ongoing passion for photography with a particular love of photographing graffiti, urban architecture, rust & decay, and cities by night. She now runs Paint Out’s web, social and visual media, and helps come up with creative ideas behind each year’s events, as well as taking hundreds of photographs and writing copy. She now collects the art of emerging artists with a special interest in political art. She also runs Art Exhibitions UK and has her own art blog. Olivia Brotheridge is Visual Arts Coordinator for Paint Out. She is a designer and illustrator and also loves to encourage other people to be creative through arts and craft events. After studying Illustration at university, where she spent a lot of time experimenting in the printrooms, she then moved to London where she worked for the dynamic arts charity The Big Draw. She then gained some gallery experience, before settling in a branding consultancy for 2.5 years. She now lives on a farm in Norfolk where she has set up a design studio, to practice her art, as well as run workshops and events. A co-founder of the initial Paint Out (2014-2015) project, Will Buckley is also a qualified barrister, published author, and senior sports journalist. He has appeared numerous times on BBC Radio, Channel 4 in the 1980s, and has appeared on Newsnight,and The Last Word. Will has also had columns or articles in TheObserver, Daily Express, GQ, The Mirror, The Guardian, New Statesman, Maxim, the EDP and, the Norwich City FC programme. Rev Dr Peter Doll is canon librarian of Norwich Cathedral and author of several books. General Manager and Arts Director of The Assembly House, Norwich, for over 15 years, who was responsible for the development and continuing success of the gallery exhibition programme at that venue. Stephanie Sinclair was Visual Arts Coordinator for Paint Out 2015. She is an art historian with over ten years of experience in the development and delivery of arts and cultural events. She co-organised the Mid-America College Art Association Conference held in Detroit in 2012, while her curation work includes contemporary ceramic exhibitions: Polemical Clay (2005), Domesticizing: Interior/Exterior Relations (2007) and Neil Forrest’s Wurzelwerk (2004). As the past Assistant Director of Development for the College of Liberal Arts and Sciences at Wayne State University, Stephanie is well versed in fund development for cultural initiatives.